The 32-year-old overcame a rough couple of years to end his fighting career on a high note. Not long after Dennis Bermudez was announced as the winner of his lightweight bout at Barclays Center Saturday, the Long Islander removed his gloves and placed them in the center of the cage. Most of the building knew what was happening, and the crowd began to respond with cheers and applause — this was the end of Bermudez’s mixed martial arts career. Bermudez, who trains at Long Island MMA, ended his time in the cage with a dominant win in his first lightweight bout by outwrestling and smothering Te Edwards over three rounds. He won 30-26 on all three scorecards during the preliminaries at UFC Fight Night. Before taking the fight with Edwards, Bermudez was unsure he’d enter the cage again. Riding a four-fight losing streak, the 32-year-old hadn’t won since August 2016. Earlier this week, he told Newsday he hadn’t decide what he’d do next, but that retirement was an option. After a commanding performance in his first lightweight bout Saturday, Bermudez chose to end his career right then and there, emotionally addressing a hometown crowd that provided plenty of support. 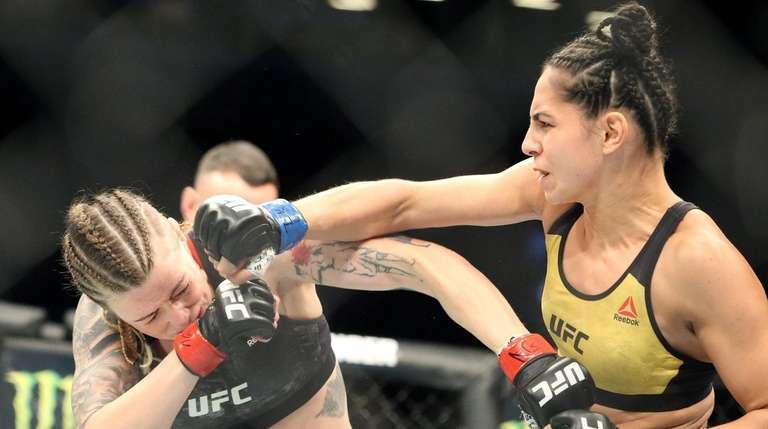 “I want my kids to look back at this and know that even though I went through adversity I went out on top,” said Bermudez, who fights out of Lindenhurst. 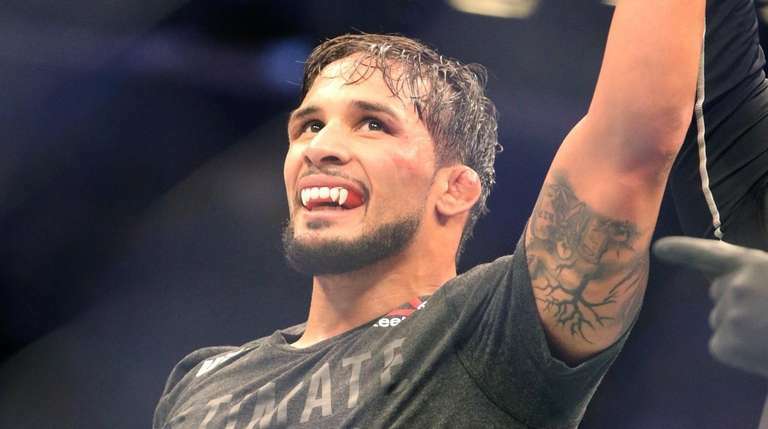 Bermudez finished his career with a 17-9 record, including a 10-7 mark in the UFC. Coach and training partner Ryan LaFlare said Bermudez is the hardest worker he knows. "He's always in competition with whoever it is, regardless if they're smaller or bigger, he 100 percent is going to be on your [expletive] trying to push you and be better than you," LaFlare said. "He's going to be successful in whatever he does." Bermudez said after the fight he planned to retire if he lost, claiming he'd rather go out on his terms than not be re-signed by the UFC. A win could've left the door open, but a key moment in the first round made retirment the clear choice. Bermudez was the aggressor to open the bout, moving Edwards against the cage and attacking the front leg with kicks. He went for a handful of takedowns early, but wound up taking some big blows from Edwards on the break. Bermudez kept looking for the single-leg takedown, but he couldn’t bring the fight to the ground until a double-leg attempt against the cage with a minute remaining in the first round. "For maybe 20 seconds, I was like, 'maybe I should just let this guy win,' but then I got to his leg and was like, 'nah, you ain't gonna win, dog,'" Bermudz said. "But the fact that I had this little conversation with myself for 20 seconds in a fist fight, when I was younger, I would never, ever think that, ever." In the second, Bermudez was able to land the single leg he couldn’t find in the opening round. Bermudez secured a kimura, effectively sitting on Edwards’ face while working the position, but Edwards eventually broke out and got back to his feet. Bermudez kept pushing the pace, landing another single leg with a minute to go in the round. Bermudez sprinted across the cage to begin the final round of his career, working his kicks to soften Edwards while waiting for an opening. After trading heavy punches, Bermudez looked for another single leg and took the fight down with ease. He nearly had a choke, but Edwards wouldn’t tap. Bermudez had a few close calls late, but he lifted his hands as the final horn sounded, fully expecting he did enough to earn that one final victory.